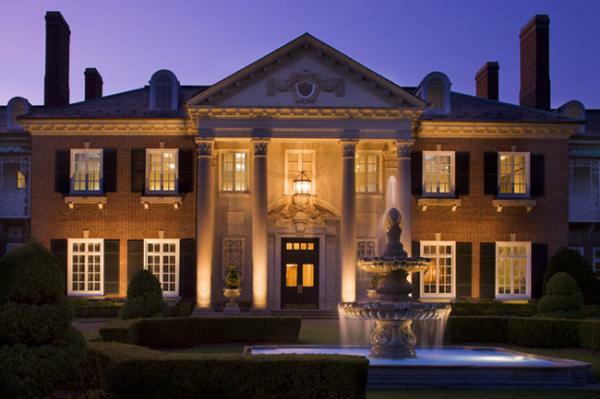 The award-winning Glen Cove Mansion, Long Island Hotel and Conference Center is situated on 55 secluded and landscaped acres on Long Island's historic Gold Coast, 30 minutes from New York City by car and rail (Long Island Railroad, Oyster Bay line, Glen Cove Station), and close to JFK International and LaGuardia Airports. The elegant property features 187 richly-appointed hotel guestrooms & suites situated in contemporary guest wings extending from the north facade of the historic Mansion, as well as the Garden Room Restaurant with magnificent views of the terraces, a large and comfortable Pub 1910, private dining rooms ideal for social and corporate occasions, and vast outdoor reception areas overlooking the mansion's Gilded Age gardens. Our Long Island Conference Center offers 29,000 square feet of event and meeting space, with 27 dedicated conference rooms accommodating from 10 to 280 guests, advanced meeting technology, an executive business center and conference concierge services.